iPhone’s battery life can quickly drain in cold weather. This blog post offers tips on how to keep it operational during such times. Winter has been cold for many of us around the world. Extreme temperatures seem like the new normal. However, electronics, especially those that function on lithium-ion batteries, aren’t suited for such conditions. The iPhone isn’t an exception. Apple says iOS devices can operate in temperatures between 0 degree Celsius and 35 degrees Celsius. When switched off, the devices are a bit stronger and can survive temperatures from minus 20 degrees Celsius and 45 degrees Celsius. iPhone owners residing in chilled parts of the globe might be similar with this landscape. If they use iPhone on a chilly day, the battery drains fast. In just a few minutes, it can lose enough power for the device to shut down. It’s not discharging though; the lithium-ion battery can’t simply operate in extremely cold weather. The lithium ions become lazy in cold, which reduces electricity flow. There isn’t a flaw in the product however. This happens on any lithium-ion battery-fitted electronic device. Fortunately, there are some things you can do to keep your handset functioning and safe it from permanent damage. If you are riding your snowboard or walking outside and don’t plan on using your iPhone, keep it switched off. As we previously mentioned, a switched off device can bear a much negative temperature range. Make sure it’s switched off, not just in sleep mode. 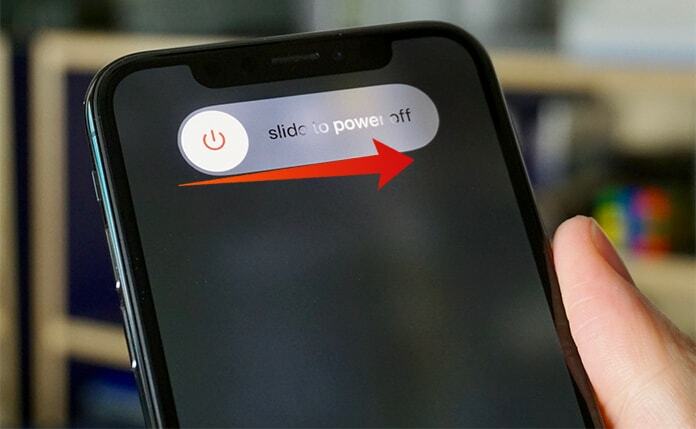 Hold sleep/wake button and swipe the “slide to power off” to turn off the handset. When you return to normal temperature, don’t switch on iPhone right away. Follow this best practice for every electronic gadget, as well as other forms of media, like audio cassettes and video tapes. Turning on a device that was out in the cold can heat it quickly. The rapid modification in temperature can affect components, resulting in damage. Moreover, you risk your device from forming condensation. If moisture finds its way inside, it can result in electronic component failing. Simply wait till your handset comes down to room temperature. This is likely to happen in a couple of minutes if you’re using those brand new, metal-encased devices. Make sure the handset isn’t cold to touch. If it’s chilly outside, chances are you’re wearing warm clothes. Perhaps a thick down-filled jacket. If that’s the case, make sure to put your handset inside a pocket. Between the clothing’s insulation and your body heat, the device should be in operational temperatures. If that isn’t a possibility, try keeping the device as close as possible to the body. Of course, there will be a limitation in usage. The buttons on the headphones’ handset enable users to control functions. For instance, Siri can be invoked by pressing and holding the headphones’ center button. We don’t advise taking out the phone and returning it to warm location again; it’s going to result in condensation, contraction and expansion otherwise. There are some instances that may offer adequate insulation for your handset. Neoprene looks like a decent option. It’s relatively cheap and has the same material as used in wet clothing. One can even be made out of a mouse pad, since many are constructed using neoprene. The material also absorbs shock really well. For those having financial resources, a robust thermal protection case is slated to be released real soon. We recommend Optimal. It’s an active, electronic thermal protection case in the works. 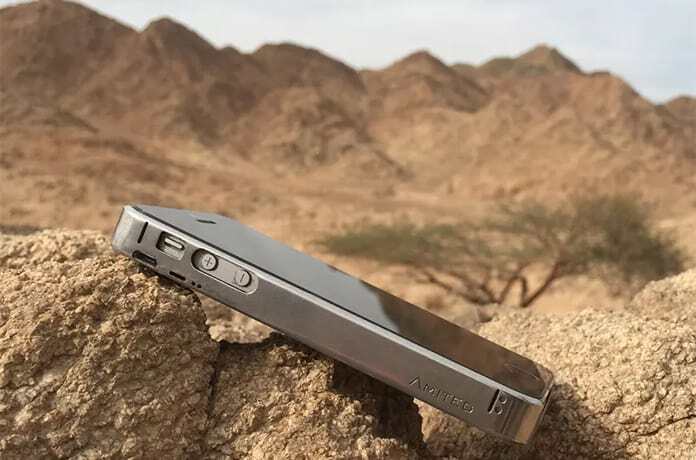 It has been purported to be a luxury solution for iPhone owners in extreme temperature. It will help maintain the iPhone’s temperature in chilly or hot weather. The case will include heating elements and fans to keep the iPhone at optimal functioning temperature. It will also make sure the iPhone doesn’t overheat when engaging or gaming with it in other resource-intense activities. The Optimal case will be just 5 mm thick and made of anodized aluminum. The case should be charged and has an internal battery, which helps it avoid draining iPhone battery. The high-tech case features several electronic components to maintain and monitor optimal temperature. It can work with Touch ID even and won’t obscure camera lens. The case is being made, however, is being crowd funded via Indiegogo. This case isn’t cheap; the price is $200. However, there’s nothing like it if iPhone has to be used in extreme temperature. Given non-operational and operational iPhone temperatures, it makes good sense not leaving the handset inside a vehicle. If you do it, make sure it’s switched off and wait for it to warm up again. The thing that makes most sense to do is take it out of the car. There might be colder temperature outside, but if the iPhone is kept in the pocket, it will stay warm and fare better. Given vulnerability of iPhone to cold weather, it’s important to prepare for emergencies. If the owner is stuck in the snow, a cold iPhone that stops functioning can be life-threatening. Even though the performance of the battery may go down, you will receive some power when it’s plugged into a charger. 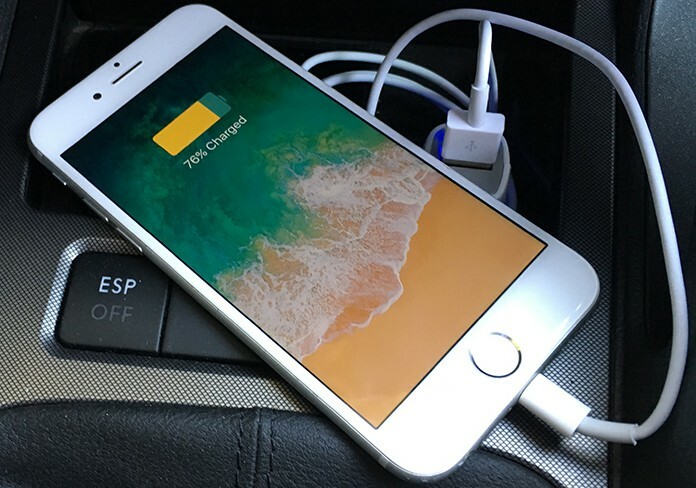 Ensure that your car-compatible iPhone charger is inside your automobile all times. They can be even plugged into the cigarette lighter. Most modern cars with a standard USB or electric outlet, so just about any charger can be used. It’s ideal to use the charger that’s from Apple. Rapid charge from excess current can damage battery. Even in chilly weather, temperature extremes could be exacerbated by rapid charge, resulting in damage to device. After iPhone 7, the iconic handsets were sandwiched between 2 glass sheets, note that glass is an insulator. 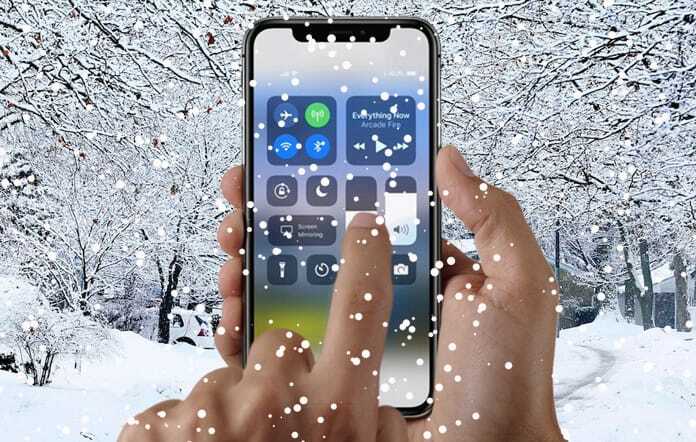 Provided this insulating function, the iPhone 8, 8 Plus and iPhone X should be operating under chilly conditions. Apple officially recommends the same temperature for these glass-sandwiched, older handsets. The law of physics indicates that they should be performing weather in chilly weather, courtesy of insulation. Of course, if the handset is left out in the cold, it doesn’t matter. However, if it’s taken out of the pocket to function briefly, it should keep operating long. When it comes to an old iPhone, you might not be too upset if the device gets ruined in temperature extremes. That said, we don’t recommend purchasing a new device for this purpose only. You might want to keep your old iPhone 4S or 4 for outdoor usage. Many carriers allow user to keep old device activated free of cost. Apple Watch works decent in cold weather. The operating temperature range is the same as the iPhone – 0 degrees Celsius to 35 degrees Celsius. It’s make may enable it to work well in cold weather. 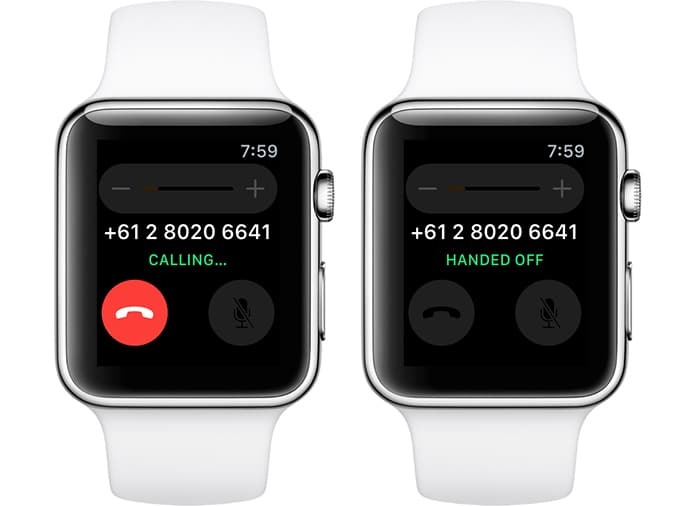 Since the Apple Watch is draped on the wrist, head from the body will stop it from getting cold. If it’s worn under a heavy coat and expose it for quick glance only, it should function in cold weather. Its material design also helps prevent Apple Watch from getting cold. The device’s front is sapphire glass, which works as insulator. The back is either a ceramic or composite material based on model. Also, the device will stay warm with body heat, even in cold weather. An Apple Watch that’s metal-backed will fare better in chilly weather, as body heat transfers via the material. Unfortunately, when it comes to temperature extreme, most electronic gadgets don’t work well. When working with a lithium-ion battery, electronic gadgets must function and be stored within a certain range of temperature. The iPhone isn’t unique in this regard. Latest iPhones are with metal body, which dissipates warmth quicker. For most individuals, heat is a big problem. Even those living in an extremely cold area are likely to use gadget indoors, where the battery’s heat and components become problematic. Apple used the right materials. Unfortunately, metal iPhones don’t work as well as extremely chilly weather. Some other handset brands are encased inside plastic. You can also buy iPhone 5C, which comes with a plastic enclosure. This might be something to consider in chilly weather. However, several northern locations have hot weather, and people stay indoors in chilly weather. On an overall basis, a metal enclosure which dissipates heat is the best and excellent design for the majority of iPhone users.